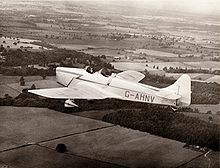 The Miles M.14 Magister was a British two-seat monoplane basic trainer aircraft built by the Miles Aircraft for the Royal Air Force and Fleet Air Arm. 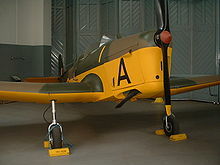 Affectionately known as the Maggie, the Magister was based on Miles' civilian Hawk Major and Hawk Trainer and was the first monoplane designed specifically as a trainer for the RAF. As a low-wing monoplane, it was an ideal introduction to the Spitfire and Hurricane for new pilots. The Magister was designed to meet Air Ministry Specification T.40/36P and first flew in March 1937. The design was based on an open-cockpit, low wing cantilever monoplane of spruce structure covered in plywood. The wing centre section has no dihedral and is of constant section with outer sections having dihedral and tapering towards the tip. Split flaps were fitted as standard. The initial M.14 was followed by the definitive Miles M.14A Magister I with a taller rudder and, eventually, anti-spin strakes on rear fuselage. Notwithstanding the relatively large number built, contemporary glues used to assemble the wooden aircraft have not stood the test of time and seemingly only one remains airworthy on the British register in 2007 with a few others designated Hawk Trainers. Production began in October 1937 and by the start of the Second World War over 700 Magisters had entered service with RAF Elementary Flying Training Schools, eventually equipping 16 such schools as well as the Central Flying School. Large numbers of civilian Hawk Majors were also pressed into service as trainers. Production of the Magister continued until 1941 by which time 1,203 had been built by Miles and an additional 100 were built under licence in Turkey. After the war many Magisters were converted for civilian uses and redesignated as the Hawk Trainer III. The 1950 Kings Cup Air Race, in which eight Hawk Trainer IIIs competed, was won by E. Day in a modified cabin version G-AKRV at 138.5 mph. At least two other aircraft were thus modified.. In 2009, 10 Hawk Trainer IIIs were registered in the United Kingdom, of which several were airworthy. Royal Australian Air Force - One aircraft. Royal Egyptian Air Force - 42 aircraft. Belgian Air Force - One aircraft operated from 1946 to 1948. Irish Air Corps - 27 aircraft from 1939 to 1952. Royal New Zealand Air Force - Two aircraft. Portuguese Air Force - Ten aircraft. Ovčx�čx�k, Michal and Karel Susa. Miles Magister: M.14, M14A, M14B. Prague, Czechia: Mark I Ltd., 2001. ISBN 80-902559-4-9. MacCarron, Donal. Wings Over Ireland'. Leicester: Midland Publishing, 1996. ISBN 1-85780-057-5. Miles Magister Pictures and Miles Magister for Sale.